How to convert physical machine to virtual Hyper-V? Both Disk2VHD and DiskGenius are effective VM converters which can help you convert physical machine to VHD. 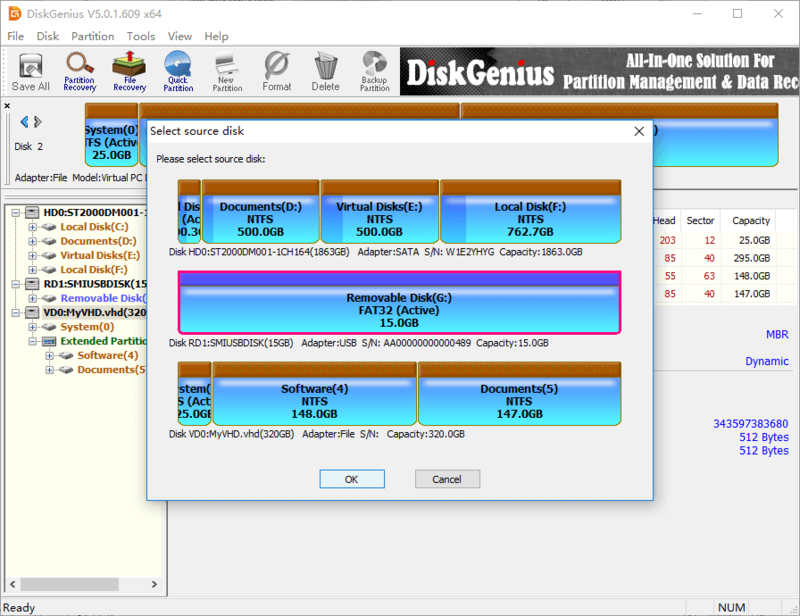 DiskGenius is the best Disk2vhd alternative and it is able to convert physical hard drive to virtual disks, including VMDK, VDH and VDI without data loss. This guide will show you how to convert physical disk to VHD with these two VM converters. DiskGenius - Top virtual disk manager to convert physical disk to VHD/VMDK/VDI without data loss. How to convert physical machine to Hyper-V with Disk2vhd? How to convert physical hard drive to virtual disk with DiskGenius? You must have learned a lot about virtualization which enables users to run one operating system on another operating system. Users prefer to convenience of virtualized environment. For example, it is a great way to keep yourself from virus or malware by using a virtual machine to browse the Internet instead of your physical PC. You may wonder whether it is possible to convert an existing physical disk to a virtual disk which can be used by virtualized platform. There is a couple of methods and converters can complete the task, and this tutorial will focus on Disk2vhd and DiskGenius. If you are looking for a how-to guide to do P2V (physical to virtual), just keep reading and you’ll be able to do the converting on your own. First and foremost, we give a quite overview of virtual machine, the counterpart of physical machine. A virtual machine is by and large a complete copy of operating system that runs inside of another copy of OS which is usually called host. The virtual version of Windows system is basically a large virtualization application which runs on Windows computer. All operations carried out in the virtual machine do not affect OS installed on host. Besides, you can reset system on virtual machine to the default state or any snapshot you need when system goes wrong. There are many virtualization tools available such as Microsoft Virtual PC, VMWare, VirtualBoX, Qemu, etc. 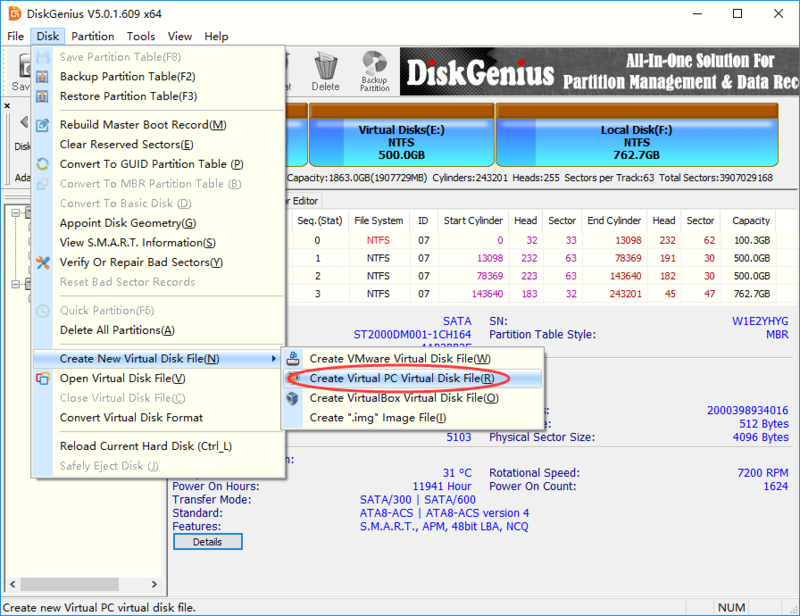 This article centers on changing physical disk to Virtual PC disk (VHD). Why do we need to convert a physical machine to Hyper-V virtual machine? There are quite a few reasons you might want to use Virtual PC. Virtual machine is very efficient and saves money and resource especially when you host multiple sites on a single server or just create a VM to test software. It requires lower hardware, energy and maintenance cost. In practice, virtual machine is usually configured with desired operating system and installs software in line with actual needs, so that you can complete specified tasks. If you are using a physical server or machine to perform certain tasks, you will benefit a lot and be cost-effective once changing configuration to virtual environments. Fortunately, there are easy solutions to convert physical to virtual. 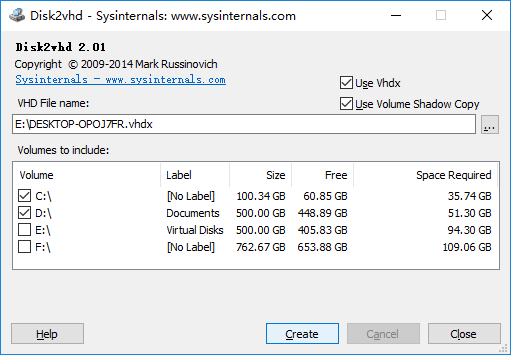 Disk2vhd is the disk-to-VHD converter provided by Microsoft Sysinsternals group to create virtual hard disk images of partitions located on physical hardware. It creates VHD (virtual hard disk) for physical disk so that it can be used in Microsoft Virtual PC or Microsoft Hyper-V virtual machines. Disk2vhd differs from other physical-to-virtual tools in that it is able to run and work when system is online. That’s because it utilizes the Snapshot feature of Windows, which makes it able to create consistent point-in-time snapshots of partitions to be converted. It is not recommended to use the VHD on the same system where you created if you want to boot from them. In general, Windows assigns the VHD a new disk signature so as to avoid conflicts before the source disk. Since Windows recognized in BCD (Boot Configuration Data) via disk signature, Windows will fail to locate the boot disk if there is collision on disk signature. Disk2vhd does not support to convert volumes which are encrypted by BitLocker. If you want to convert such volume to VHD, you need to fully decrypt volume and disable BitLocker first. DiskGenius is the best Disk2vhd alternative. 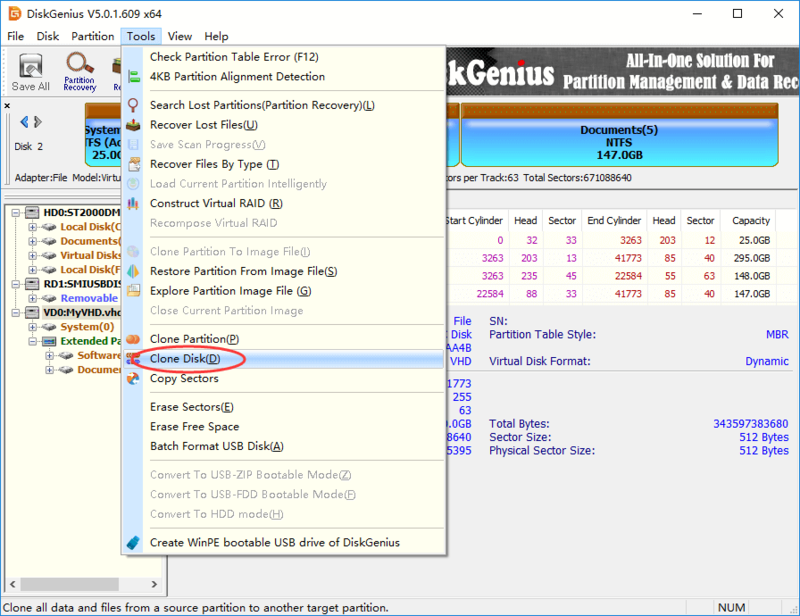 DiskGenius is complete data recovery and partition manager software for physical and virtual disks. It is able to convert physical disk to VMDK, VHD and VDI virtual disks. With DiskGenius you can open and load virtual disks without launching virtual machines, after which you can manage partitions on virtual disk, such as resize partition, clone partition, recover lost data & partition, etc. DiskGenius is also able to create virtual disks for VMWare, Virtual PC and Virtual Box. Besides, converting virtual disk format among VMDK, VHD and VDI without losing data are also available, for example, convert VMDK to VHD, convert VDI to VHD. You can click Disk menu and choose "Open Virtual Disk File" to open virtual disks you need, for example, the disk VD0:MyDisk.vmdk(120GB) is opened in this way. Then, you can manage partitions on the disk or even recover lost or deleted files. All operations done to the virtual disk are the same as the physical disk. Data recovery: recover deleted or lost files & partition from all kinds of storage devices. Partition management: create, delete, format, clone, resize, image, hide, wipe partition. Data backup: backup operating system and personal data; clone disk & partition, image disk & partition. Disk utilities: check and repair bad sectors, edit hex data, wipe disk, convert MBR/GPT, convert dynamic disk to basic. Supported device: hard drive (IDE、SCSI、SATA), external HDD, USB flash drive, SD card, virtual disk (VMDK, VDI, VHD), etc. Fully supported file system: NTFS, exFAT, FAT32, FAT16, FAT12, EXT2, EXT3, EXT4. Therefore, DiskGenius is an ideal Physical to VM converter and the best Disk2vhd alternative, as it is not only able to convert physical to virtual, but also provides many powerful functions to manage virtual disk space and data, keeping data safer and making machine running at its best. For the sake of a successful disk-to-VM conversion and in case of any unexpected issue appears during conversion, we’d better do some preparations before converting. Backup important data: You can back up operating system as well as individual data with DiskGenius or Isoo Backup, so that you will be able to restore Windows and data once anything goes wrong. Optimize OS: It’ll be ideal if operating system is running at its best when you convert it. Thus, you can use Disk Cleanup or Disk Defragmenter to clear unnecessary files and trash data so as to improve performance. Install Windows update: Check and install virtual system updates to make sure system is up-to-date. Step 1 Download Disk2vhd utility from Windows Sysinternals page. Step 2 Run Disk2vhd from your physical computer you want to convert. Step 3 Convert disk to VHD/VHDX. Select volumes you want to convert and set a destination location to save the VHD/VHDX file. It is not commended to select a different disk to store the virtual disk. If you want it to be a bootable disk, then select the system disk together with boot area (System Reserved). Disk2vhd supports converting disk to VHD and VHDX, and you can choose virtual disk format by selecting "Use Vhdx". Besides, you can also select "Use Volume Shadow Copy" to create a transaction-consistent version of the disk instead of a crash-consistent version. Click "Create" button and Disk2vhd starts to convert. Wait for the process to complete. Even in the ideal case, the traditional method to convert physical to virtual is an effort and time-consuming task, for if you miss any step or make a mistake during the converting process, the converting may end up with failure. Fortunately, you can use DiskGenius to do the conversion and it performs the conversion easily and quickly. DiskGenius can do a sector-level copy of disk during converting if necessary for example converting encrypted volume, so that the converted virtual disk can be identical to original drive. Besides, you can convert physical disk to other types of virtual disk such as VMDK and VDI. Step 1 Create VHD disk. Set file path and capacity for the VHD file and click Create button. 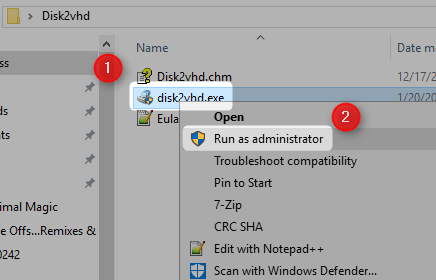 You need to select a location on your computer to store the VHD virtual disk and set a name. As to the capacity, you should make sure it is no less than the size of physical disk you want to convert. After clicking Create button, the VHD disk will be created by DiskGenius quickly. The newly created virtual disk is not partitioned and it is all unallocated/free disk space. You can partition the disk by selecting the disk and click Quick Partition button. It is OK to leave it unpartitioned. Step 2 Convert physical disk to virtual disk. In the "Select source disk" window, choose the physical disk you want to convert and click OK button. Select the VHD disk you just created with DiskGenius and click OK button. Note: make sure you are selecting the correct disk here. Select cloning mode and click Start button. In most cases, "Copy all files" is enough to meet various needs. If there is encrypted partition on the disk, you may need to choose "Copy all sectors". Click OK button to continue. 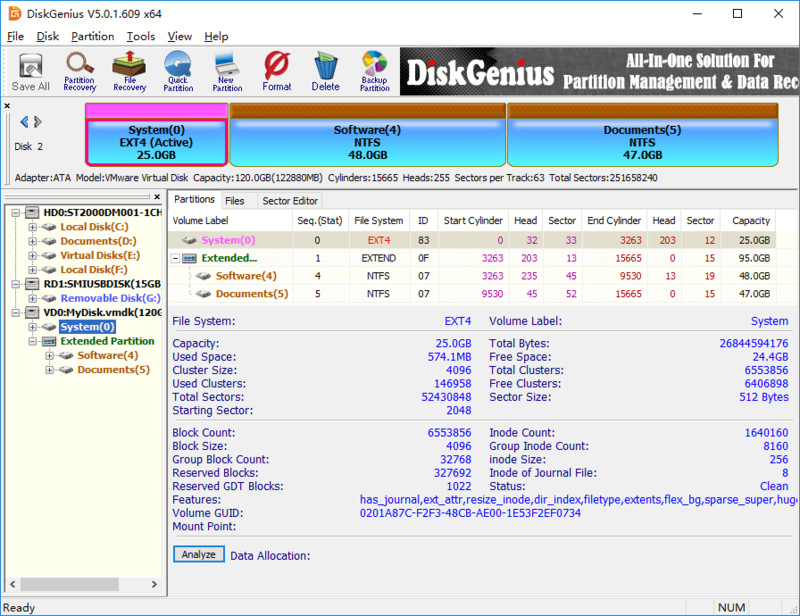 DiskGenius prompts the rest operations will remove everything on the destination disk, and you should make sure data on the destination disk has been properly backed up. Choose whether to create a disk signature for the destination disk. You can make the choice based on your actual situation. Click Yes or No and DiskGenius starts the conversion. When the process completes, close the software. The article briefly introduces Disk2vhd and its alternative DiskGenius, as well as discusses how to convert physical disk to virtual with these two physical-to-VM converters. As you can see, it is quite easy to convert physical disk to virtual disk if you choose proper converter software. For information on Disk2vhd alternatively or conversion details, please refer to online help or contact our support team. DiskGenius - The best Disk2vhd alternative to convert physical machine to virtual Hyper-V.